On arrival at the Airport meet our representative and transfer to hotel. New Delhi, the capital of India, sprawled over the west bank of the river Yamuna is one of the fastest growing cities in India. It is surrounded on three sides by Haryana and to the east, across the river Yamuna by Uttar Pradesh. Historically, the city has long since been the foremost in political importance with successive dynasties choosing it as their seat of power, between the 13th and the 17th centuries. Remnants of the glorious past survive as important monuments in different parts of the city. Overnight at Hotel. The myriad faces of the city are simply fascinating. In some places it remains a garden city, tree lined and with beautiful parks, but in some places it can also be crowded with heavy traffic. Turbaned Sikhs, colourfully dressed Rajasthani and Gujarati women working in offices, Muslim shopkeepers along Chandni Chowk in Old Delhi, Tibetans and Ladakhis in the street stalls along Janpath and Kashmiris in the handicraft emporia around Connaught Place, all add to the cosmopolitan feel of the city. In the evening cultural dance show program. Overnight at Hotel. After breakfast at hotel, drive to Jaipur. On arrival check in to hotel. Jaipur, is the largest city in Rajasthan and not only provides a stepping stone to the enchanting desert cities of Jodhpur and Jaisalmer, but offers several massive forts of its own - tributes to the Rajputs who once ruled the land. It is called the "pink" city because of the color of its historical buildings built by Maharajah Jai Singh. Inside the historical area, city regulations require that all buildings be painted pink so that the character is maintained. It is a bustling, dusty, chaotic city that will confuse and overwhelm an ordinary traveler's senses. 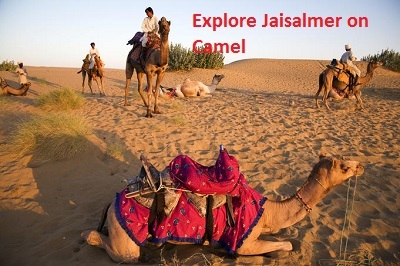 Jaipur, Delhi and Agra make up the famous Golden Triangle, the most popular tourist route in the country. 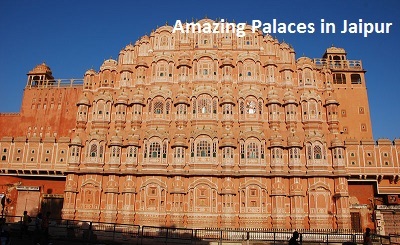 In the morning visit Hawa Mahal and afterthat visit Amber Fort, City palace and Observatory. Amber Fort : The Amber fort greets one with regal architecture (and elephants giving rides to tourists!) derived from Hindu and Muslim styles. There are two main halls 'Diwan-e-Aam' (hall for commons) and 'Diwan-e-khaas' (hall for dignitaries). Inside the fort, there are two palaces where the king used to stay, one for summer and one for winter. The winter palace is called the 'Sheesh Mahal' (house of glass). There's a 'Kaali' temple inside the fort. One cannot wear leather when entering into this temple. Beware of monkeys at this fort. There are a lot of handloom shops at the bottom of the fort but the prices are high and the quality may not be very good. After breakfast drive to Agra en-route visit Fathepursikri. Upon arrival check in to hotel. Afternoon sightseeing for Agra fort. Agra's dominant structure, the Agra Fort (sometimes called the Red Fort), was built by Akbar in 1565. The red sandstone fort was renovated and converted into a palace during Shah Jahan's time, and reworked extensively with marble and pietra dura inlay. Notable buildings in the fort include the Pearl Mosque, the Diwan-e-Am and Diwan-e-Khas (halls of public and private audience), Jehangir's Palace, Khaas Mahal, Sheesh Mahal (mirrored palace), and Musamman Burj. In the morning sightseeing of Taj Mahal. It was completed in 1653 A.D, The Taj Mahal built by the Mughal Emperor Shah Jahan as the final resting place for his favourite Queen, Mumtaz. Finished in by Marble, it is perhaps India most fascinating and beautiful monument. This perfectly symmetrical monuments took 22 years (1630-1652) of hard labour and 20,000 workers, Masons and Jewellers to built and it is set amidst landscaped gardens. Built by the Persian architect, Ustad Isa. The Taj Mahalis built at the bank of the Yamuna river. 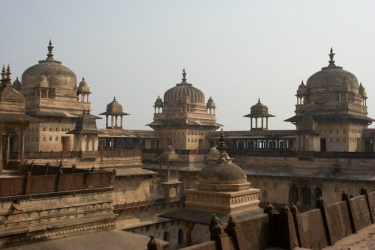 It can be observed like a Mirage from the Agra Fort from where Emperor Shah Jahan stared at it, for the last eight years of his life as a prisoner of his son Aurangzeb. It is a masterpiece of symmetry, Seeming to be floating in the air from a distance, and each revealed as an illusion experienced as one enters through the main gate. Overnight at hotel. Drive you to Khajuraho. On arrival check in to hotel. In afternoon sightseeing tour western group of temple. Half day sightseeing tour of Khajuraho. Afternoon start road journey to Varanasi(6 hrs). On arrival at Varanasi. Enroute visit Sarnath. Sarnath -where the Buddha preached his first sermon in the Deer Park, contains the most impressive remains, as well as a modern temple Transfer to hotel. Early morning visit the sacred river Ganges before sunrise, to see how the Hindus of Varanasi pray to the rising Sun and then pray to the river Ganges. Enjoy a boat ride on the Ganges and see the cremation grounds from the boat. Return to your hotel for breakfast. Later visit the Golden Temple, Bharat Mata Temple and Birla ( Shiva ) Temple. In the afternoon transfer to Railway station for overnight journey to Delhi.